Complementary and Alternative (CAM) therapy use has been and continues to be prevalent in cancer patients, some of whom are taking herbal supplements. Studies indicate that 20% to 77% of these patients do not disclose their CAM use to their physician. Herb-drug interactions pose a considerable risk to the oncology patient population. The potential impact of any given herbal supplement on cytochrome isoenzymes, P-glycoprotein, UDP-Glucuronosyltransferase (UGT) enzymes, and other drug metabolism pathways needs to be evaluated to establish the risk of interactions with each medication that a cancer patient is taking. A review of the available literature reveals a varying array of human volunteer studies, case reports, in vitro and in vivo studies, often with contradictory results. Individual herbal products can greatly differ in the composition of their constituents, bioavailability, and thus interaction risk. A simplified clinical decision making guideline was developed to assist in easing the burden for physicians when faced with the question of whether a patient can safely take a particular herbal product. The guideline provides different scenarios with recommendations on how to approach each situation, as well as, recommendations for evidence-based non-herbal options to actively engage patients in their symptoms, while avoiding potentially deleterious interactions. Open dialogue about whether or not herbal supplements are appropriate, given the phase of treatment the patient is currently in, and having other options to suggest as alternatives may improve patient disclosure of herbal supplement use and compliance with their physician’s recommendations to discontinue supplements when necessary. Complementary and alternative (CAM) therapy use has been and continues to be prevalent in cancer patients. The prevalence of CAM use among cancer patients ranges between 11% and 95% , with between 20% to 77% of these patients not disclosing their CAM use to their physician. It is also disturbing that up to 68% of physicians were unaware of supplement use among their cancer patients . Herb-drug interactions pose a considerable risk to the oncology patient population. Here we address two clinical situations that a physician is likely to encounter in the clinic. (i) Patients who do volunteer that they are taking herbal supplements and ask their physician for advice. (ii) When prompted if taking herbal supplements, what a physician should consider if or when a herbal supplement should be integrated with anti-cancer therapy. As is often the case, there are many competing tasks for decision-making that a physician attends to in a busy practice. He or she may be uncomfortable with making a determination or does not have the time/resources to evaluate every supplement the patient is thinking about taking or taking. A simplified approach is needed to guide physicians on how to manage a patient’s use of herbal supplements. Previous discussions concerning herb-drug interaction risk have focused on cytotoxic or targeted chemotherapy or herbal supplements that are contraindicated prior to surgery. Ideally, a review of potential herb-drug interactions for all medications that oncology patients are using should be performed, given the narrow therapeutic index of some drugs. Articles containing extensive tables to help guide the reader about potential interactions can be time-consuming to find, read, and process, making them impractical for physicians needing to efficiently make clinical decisions. A quick reference resource for common herbal products can be found here (http://www.mskcc.org/cancer-care/integrative-medicine/about-herbs-botanicals-other-products). The potential impact of any given herbal supplement on cytochrome isoenzymes, P-glycoprotein, UDP-Glucuronosyltransferase (UGT) enzymes, and other drug metabolism pathways needs to be evaluated to establish the risk of interactions with each medication that a cancer patient is taking [3,4]. Table 1 highlights some of the key mechanisms of interaction with a representative causal herb. Additionally, practice guidelines for integrative oncology recommend that dietary supplements and mega doses of vitamins and minerals be evaluated for possible side effects and potential for interaction with chemotherapy and to consult a trained professional . Unfortunately, these guidelines do not help the provider with an immediate or near-term need. In order to simplify the approach to evaluation, it is important to understand the potential mechanisms of interactions. Herb-drug interactions may have Pharmacokinetic (PK) and/or Pharmacodynamic (PD) components. A PK interaction may also lead to increased or decreased plasma levels of the drug and thus unexpected toxicities or reductions in efficacy. Many herbs are suspected of inducing or inhibiting the metabolism of drugs that are substrates of cytochrome P450s and/or P-glycoprotein . A well-known example is St. John’s Wort, which can induce expression of CYP3A4 and P-glycoprotein . In an unblinded, randomized crossover study, co-administration of St. John’s wort and irinotecan caused a 42% reduction in irinotecan’s active metabolite, SN-38 . A PD interaction could lead to increased risk for adverse events such as bleeding or hepatoxicity. For example, a recent case report discussed a severe case of liver toxicity in a patient taking temozolomide and a Chinese herbal formula . After discontinuing both the Chinese herbal formula and temozolomide, the patient’s liver enzymes slowly normalized. The patient was then retreated with temozolomide without the Chinese herbal formula for 5 cycles without a recurrence of hepatotoxicity. Additionally, some herbs may have estrogenic effects, which would be a contraindication in hormone-sensitive cancers. A review of the available literature reveals a varying array of human volunteer studies, case reports, in vitro and in vivo studies, often with contradictory results . Individual herbal products can greatly differ in the composition of their constituents, bioavailability, and thus interaction risk. For example, preclinical studies have suggested that green tea may reduce CYP3A4 activity. A human volunteer study evaluated the effects of an 800 mg Epigallocatechingallate (EGCG) dose for 4 weeks (a catechin in green tea extract). The results indicated a 20% increase (p=0.01) in the area under the plasma buspirone concentration-time profile that suggests a small reduction in CYP3A4 activity . In an in vitro study evaluating the inhibitory effect of different brands of herbal supplements, green tea extract varied the most in CYP3A4inhibition, ranging from 5.6%to 89.9% inhibition . The variability was thought to be due to variations in the content of the herbal product's active ingredients . Another in vitro study with green tea and docetaxel confirmed that green tea is a potent inhibitor of CYP3A4 . There are additional factors to consider in evaluating herb-drug interaction data. Often, in vitro and in vivo results are used as initial indicatorsof interaction risk. However,before drawing definitive conclusions, one typically awaits data on probe drug cocktails used in human studies, as these may reveal that the potential interaction may not be clinically significant . An example of a probe drug is midazolam, a gold standard CYP3A probe substrate metabolized extensively by intestinal and hepatic enzymes . Theoretically, an herb should be studied with a probe drug in human volunteers to evaluate CYP interaction potential. The challenge is further complicated by the fact that most herbal products are not manufactured like pharmaceutical drugs. Even if they are standardized to a particular constituent, the standardized constituent may not be the constituent responsible for the interaction. In addition, there are bioavailability differences between products. Even within the same manufacturer’s products, there can be inherent variability in the raw material and thus finished product, thus causing differences in the mixtures of the bioactive constituents. Thus, results from a single human studycan really only be applied to the specific batch of the herb used in that study. They may not be applicable to other batches of that same herb, even with the same manufacturer, since there may be differences in the raw material used in the supplement. In addition, some herbs may contain intentional adulterants (including pharmaceuticals) , or unintentional contaminants, such as pesticides , heavy metals , and/or microbial organisms . Lastly, many herbs have never been evaluated with cytochrome isoenzymes, P-glycoprotein, or any of the other possible mechanisms of interactions. This makes the process of advising patients even more difficult, due to the paucity of available and reliable information to be able to predict anherb-drug interaction. With all of this variability in potential herb-drug interactions and their implications for clinical care, as well as lack of sufficient research, physicianscan find it challenging to have an open dialogue with patients about what is known and what is still unknown with herb-drug interactions. An herb-drug interaction can be well tolerated, cause minor issues, or result in a serious adverse event or treatment failure. 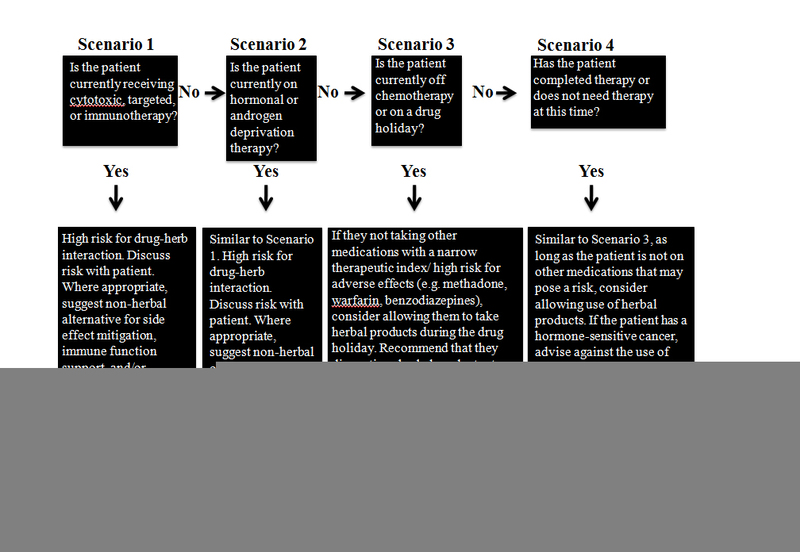 The following is a clinical decision making guidelinethat is intended to assist in easing the burden to physicians when faced with the question of whether a patient can safely take a particular herbal product (Figure 1). Scenario 1: Is the patient currently receiving cytotoxic, targeted, or immunotherapy? The potential risk for herb-drug interactions is high, either with the drug regimen itself or with common supportive care medications, such as anti-emetics, analgesics, etc. Discuss the risks with the patient, understanding that the patient may wish to take an herb with the intention of mitigating a side effect, supporting immune function, or improving quality of life. When appropriate, consider a non-herbal alternative (Table 2) to offer to the patient instead. Scenario 2: Is the patient currently on hormonal or androgen deprivation therapy? If the patient is currently undergoing treatment, the risk of herb-drug interactions is high, particularly with hormonal therapies and oral anti-androgen agents. Discuss the relative risks with the patient and consider offering non-herbal options. Scenario 3: Is the patient currently off chemotherapy or on a drug holiday? If so, are they taking any other medications with an arrow therapeutic index/high risk for adverse effects? Examples include: methadone, warfarin, benzodiazepines, etc. For patients that are on a chemotherapy break and not taking other medications that would pose significant risk for herb-drug interaction adverse effects, consider allowing them to take herbal products during the drug holiday. Recommend that they discontinue herbal products at least 7 days prior to returning for re-evaluation clinical assessment to allow a sufficient wash out period should they need to resume systemic anti-cancer therapy at their follow up visit. If the patient is on medications that may pose a risk, recommend non-herbal options and discuss the relative risks. Scenario 4: Has the patient completed therapy or does not need therapy at this time? As above, as long as the patient is not on other medications that may pose a risk, consider allowing the use of herbal products. If the patient has a hormone-sensitive cancer, advise against the use of any herbs with estrogenic potential. For patients that are not appropriate candidates for herbal products to be integrated into their treatment regimen (for example scenario 1 or 2 from above), physicians may wish to consider providing an additional rationale to support their recommendation against herbal product use. One way this can be achieved is simply sharing with the patient that there is no evidence that it will not potentially impact their treatment’s effectiveness and/or worsen their side effects. This may foster the opportunity for more open dialogue and shared decision-making with the patient. The quality of communication in cancer care has been shown to impact patient satisfaction, decision making, patient distress and well-being, and compliance , which is critical in managing the use of CAM in an oncology patient population. After providing the patient with the rationale for when he or she should not take an herb, a follow up recommendation may prove helpful, such as suggestions for non-herbal alternatives, to increase the likelihood of compliance. It is important to understand why patients use CAM therapies. A recent article noted that patients receiving chemotherapy may be using CAM therapies to treat cancer, to lessen chemotherapy side effects, for symptom management, or to treat conditions unrelated to their cancer . Time permitting, it may be useful in your dialogue with the patient to inquire why they were taking or wishing to take the herb. Following that discussion, consider an evidence-based alternative to offer to the patient. Table 2 provides non-herbal alternatives to actively engage patients in helping manage their symptoms. Example for Scenario 1: 65 year old former smoker with EGFR mutated adenocarcinoma of the lung currently on erlotinib. The patient wants to take echinacea for immune support and laetrile for potential anti-cancer effects. Erlotinib is a CYP1A2 and CYP3A4 substrate. The data on Echinacea are conflicting, but some echinacea products have been shown to inhibit CYP3A4 , which may increase erlotinib side effects. Laetrile, sometimes erroneously known as vitamin B17, is a semi-synthetic compound which is chemically related to amygdalin, a cyanogenic glycoside from the kernels of apricots. Laetrile may cause cyanide poisoning and claims of anti-cancer effects have not been substantiated. The recommendation for handling this situation is to discuss the risks of interactions with erlotinib, as well as, the lack of evidence for efficacy and the risk for cyanide poisoning from laetrile. Patients are often unaware of potential for drug interactions or adverse effects from natural products, as they may make the assumption that just because it is natural that is "safe". Provide further explanation that you do not want the patient to take anything for "anti-cancer effects" that may interfere with the potential efficacy of erlotinib. Offer a recommendation that the patient try safer options for immune support and suggest that the research is very preliminary, but that relaxation exercises may confer benefit. Example for Scenario 2: 32 year old stage II breast cancer patient who just completed adjuvant chemotherapy and radiation and is now on tamoxifen and having hot flashes. She is hoping to take black cohosh to mitigate her hot flashes. She is not interested in taking venlafaxine. The recommendation for handling this situation is to express concern that black cohosh may interfere with tamoxifen (black cohosh inhibits CYP2D6) . Discuss that the patient may wish to consider yoga, as it may help with her hot flashes, in addition to other menopausal symptoms. You may wish to use the opportunity to discuss the benefits of exercise overall for breast cancer patients. The patient may be relieved that you provided a recommendation as an alternative to the herbal product since she does not wish to start a medication for her hot flashes. Example for Scenario 3: 58 year old patient with multifocal stage IV colon cancer that has now stabilized onsystemic treatment. The patient is complaining of significant fatigue and a poor quality of life. The patient is offered a drug holiday for two months. He inquires about taking curcumin, as his wife has read about recent research on the herb having potential anti-cancer effects and really wants him to start taking it. The patient is currently taking ranitidine, citalopram, and metformin. Discuss with the patient that he may take curcumin during the drug holiday. He should discontinue taking curcumin if he develops any new symptoms, as these may signal possible interactions with any of his current medications. Recommend that he discontinue curcumin 7 days prior to his follow up clinic visit in case systemic chemotherapy needs to be resumed. Example for Scenario 4: 55 year old patient with a T1c, Gleason 3+3 prostate cancer status post prostectomy without any adverse features on pathology is recommended to undergo monitoring per prostate cancer guidelines . He has a history of taking numerous supplements in the past and wishes to "do everything he can" to keep the prostate cancer from coming back. He asks if he can take green tea extract, maitake, and saw palmetto. He is currently taking lisinopril, rosuvastatin, and occasional acetaminophen. Discuss with the patient that he may take the supplements, but to monitor his blood pressure for any changes after he starts the regimen and discontinue if he starts to develop any new symptoms, which might signal an interaction. These examples illustrate a process of using the guidelines to determine relative risk of taking an herbal product and consideration for allowing use if the patient is at low risk for an herb-drug interaction. This may help map out a reasonable approach to patient's questions about herbal products. Furthermore, these recommendations emphasize patient safety and remind patients that they may need to discontinue the herbal product if they develop a new symptom or if they experience a change in a condition currently managed on medication (such as the example for scenario 4 with a patient taking an anti-hypertensive). In summary, studies have revealed that many patients are using CAM therapies and that some of those patients may also be taking herbal products. Physicians need efficient guidelines to manage the use of herbal products. Open dialogue about whether or not herbal products are appropriate, given the phase of treatment the patient is currently in, and having other options to suggest as alternatives may improve patient disclosure of herbal product use and compliance with their physician’s recommendations to discontinue supplements when necessary. 17. Rossi F, Gaio E, Torriani S. (2010) Staphylococcus aureus and Zygosaccharomyces bailii as primary microbial contaminants of a spoiled herbal food supplement and evaluation of their survival during shelf life. Food Microbiol 27: 356-362. Copyright: ©2014 Birdsall S. This is an open-access article distributed under the terms of the Creative Commons Attribution License, which permits unrestricted use, distribution, and reproduction in any medium, provided the original author and source are credited. Cancer Treatment Centers of America, 14200 W. Celebrate Life Way, Goodyear, AZ 85338, USA, Tel: (623)-207-3370; Fax: (623)-321-1528.